What is a Utah State Good Sam RV Rally? 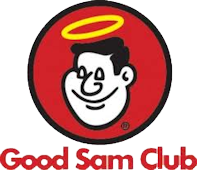 Did you know you don't have to be a Good Sam member or in a Chapter to attend? Parking: Hobo parking -- Chapter arrival times will be posted two weeks before event. Late arrivals park in the holding area until 8:00 AM next morning. considered upon written request, first come first served. 9881 South Spruce Dale Dr.